Pierce potatoes several times with a fork. On a microwave-safe plate, microwave potatoes for 3 1/2 minutes. Flip potatoes, and microwave for 3 1/2 more minutes, or until soft. Once cool enough to handle, cut potatoes in half lengthwise. Use a spoon to gently scoop out the pulp, leaving about 1/4 inch inside the skin. Discard the pulp (or reserve for another use). Place potato skins on the baking sheet. Bake until crispy, 12 - 15 minutes. Remove sheet, but leave oven on. 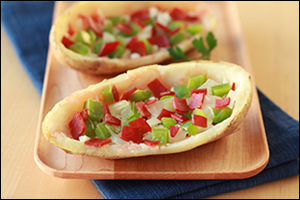 Place bell pepper and onion in a small microwave-safe bowl. Cook for 45 seconds, or until slightly softened. In another small bowl, stir seasonings into crushed tomatoes. Evenly distribute mixture among potato skins. 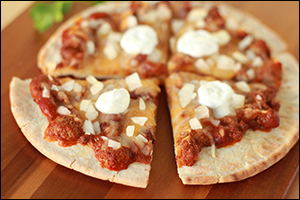 Sprinkle with shredded string cheese, and top with veggies and chopped pepperoni. Lay pita on the baking sheet and evenly spread with chili, leaving a 1/2-inch border. Sprinkle with cheese. Sprinkle with chopped onion. Cut into 4 slices, and top each slice with yogurt. Yum! What? Like your friends will be upset that you sent them pizza recipes? Exactly -- click "Send to a Friend" now.